Life teen is a tri-parish youth ministry program comprised of St. Thomas More Newman Center, Sacred Heart and Our Lady of Lourdes parishes. The main components of our program are spiritual formation, Catholic catechesis, community and discipleship. It’s fun to learn about your faith with your friends, and our hope is that every Life Night is not only fun, but also challenges you to go deeper in your relationship with God and to know more about your Catholic faith. 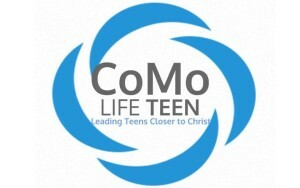 CoMo Life teen is a tri-parish community dedicated to serving high school students in Columbia, MO. The Life Teen core Team strives to build a community of faith, love and friendship for each one of our students at every Life Night and Life Teen event. We also participate in a number of yearly events, camps, and retreats. The Luke 18 retreat is put on by our high school students for the 8th grade retreaters. Our summer opportunities include Steubenville Mid-America, Camp Siena, Camp Maccabee and CHRISTpower. Newman Disciples room (upstairs), 10 a.m.
Join us for Bible Study and some yummy breakfast! Class sessions are second Sunday of the month from 2:30 – 4:30 p.m. in assorted locations. April 28 – Rehearsal for Confirmation ceremony, 3:30 – 4:30 p.m.
*Please note that all dates are requirements unless otherwise indicated. **All sessions are from 2:30 p.m. – 4:30 p.m. unless otherwise indicated. This includes parent sessions. ***All sessions are at the small group houses unless otherwise indicated. ****Please note that the October session is not on the second Sunday of the month due to Newman’s Parish Picnic. However, the Rite of Enrollment will still take place that Sunday.